It's not weird that on Remembrance Day I would read this comic and think of my Father. He bought me my first Batman comic and always supported my hobby and my love of the superheroes. He was a soldier and a Peacekeeper and we had a kind of Batman/Robin relationship. I was very lucky to have him in my life for as long as I did. I love my Batman comics. It was the first title I ever read and for going on 40 years it has been one true stable thing in my life. 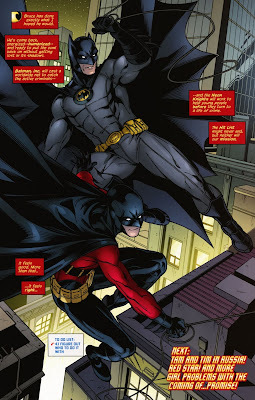 I have put up with the grim and gritty Dark Knight and alot of creators doing bad things to the Bat Family of characters. 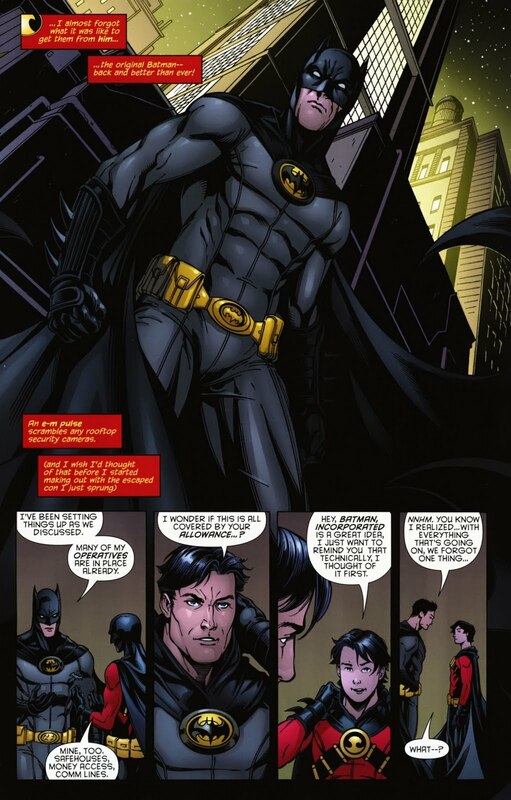 None so terrible as the resent 'Bruce Wayne Returns' storyline by Grant Morrison. Many think this guy is a genius and yes, in the past, he has done some nice storytelling. However I refuse to give him a pass on the crap he has put me through for the past couple of years from 'Final Crisis' on down through 'Batman RIP'. I hated him but I stuck with it. Through no effort of his, I finally got the payoff I was waiting for all this time. It seemed like Batman was going to stay lost in the shadows with a case of ennui that a whole cave full of anti-depressants couldn't cure. But now he is back. He is healed. He is better than ever. There must always be a Batman and now we have the one we always hoped and wished for. This picture says it all. Tim Drake never stopped believing that Bruce would come back. 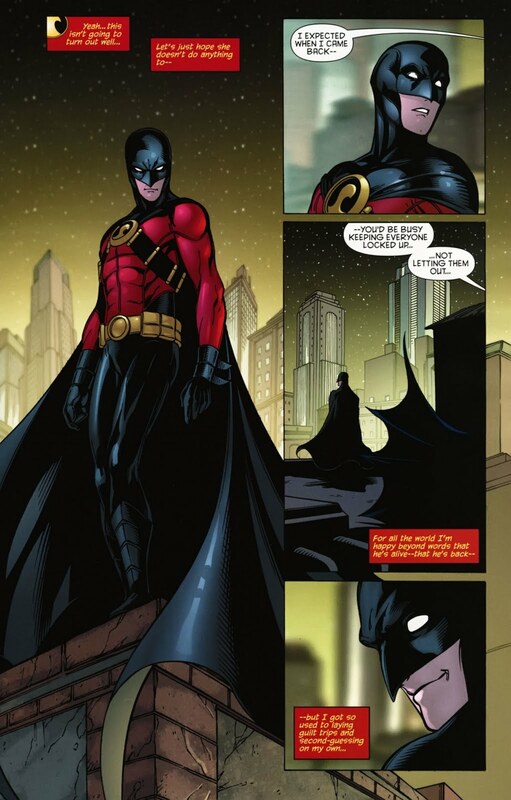 The third Robin took on a new identity as Red Robin but kept fighting for the dream of his mentor. This brought it all full circle for me. If you have no idea what I have just been talking about then I feel a bit sorry for you. You really miss out not being a comic geek. This is beautiful and I'm not ashamed to admit it choked me up a bit. I just picked this one up in my semi-monthly trip to the comic store. Very eager to read it. And I totally agree with you about Final Crisis and RIP. 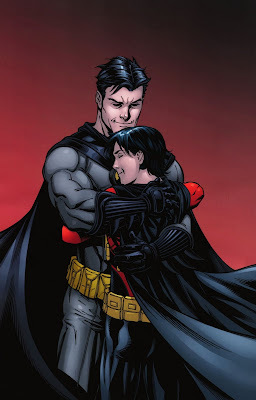 I'm so late coming across this, but I have ALWAYS been a Batman fan and although I love Grayson, Tim is my favorite Robin - I love his attitude and beliefs. I am sad to say though I am just now recently beginning to read the graphic novels and comics. I AM HOOKED! I went out and bought one and loved it so much i bought 5 more the very next day. 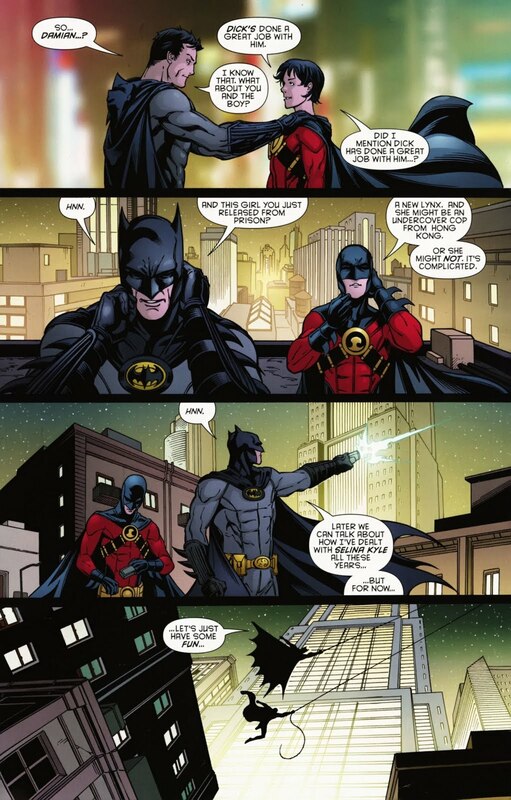 I was just wondering what comic or graphic novel is this from? I love it! Such a great moment, I would love to read the story around it. Thanks!